In his book, Smarter Than You Think: How Technology Is Changing Our Minds For The Better, Clive Thompson talks about the emergence of important new digital literacies. He asks the question of what it means to be literate in a world where our relationship with digital technologies is omnipresent. According to Internet Live Stats, a highly recognized developer of visual statistics, over 3 billion people around the world use the Internet on a daily basis basis. 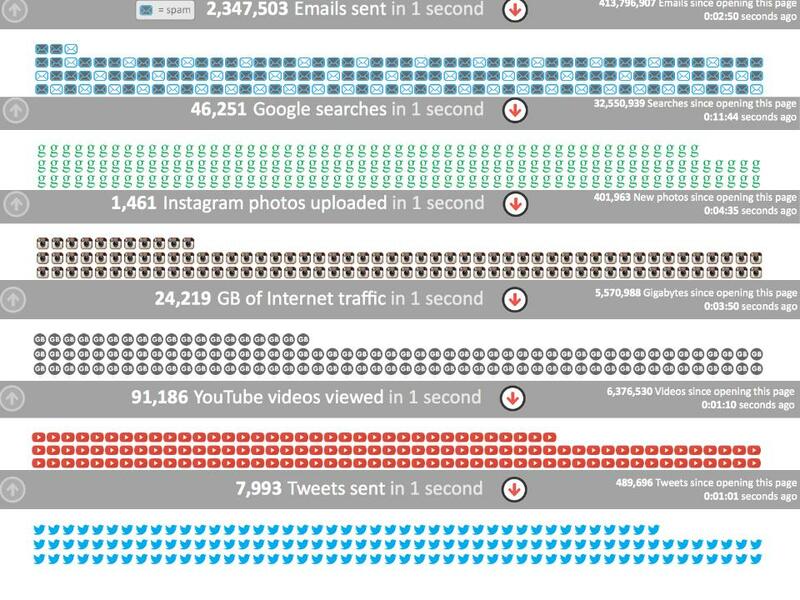 Almost 2.5 million emails are sent every second. 5.5 million videos are viewed on YouTube every minute, and 165 million people query Google every hour (“Internet Live Stats,” n.d.) A massive amount of data is exchanged on the Internet each second. We used to query libraries for knowledge and information, but now we query powerful search engines instead. In order to make sense of the information and data we produce every second, we need a new set of skills – new literacies. The art of searching or finding is an emerging digital literacy. In chapter 5 of Thompson book, The Art of Finding, three important ideas stood out. With Petabytes of data being generated and transferred every hour through the Internet, a mass of data and information is produced. Those who can develop the skills to search, extract, and make meaningful sense of the data will be more literate than those who cannot. Developing accurate search techniques can be developed at an early age and should be taught in all k-12 schools. Google has realized the importance of effective and efficient searching and offers two excellent video tutorials on power-searching. If we choose not to embrace new digital literacies or equip our learners with a new set of tools we are doing them a disservice, and from a global perspective we may be inadvertently leaving them behind. With a massive amount of content being created and shared every hour, I find it almost unthinkable to reread a book or re-watch a video. Like Thompson suggests in this chapter, I invariably end up skimming over the content, unable to comprehend at a deep level, but able to get the gist of the topic. In my defense, I make copious notes but the reality is unless I develop methods to organize, store, and retrieve that information for later use, I am a less active learner. As we create and store more and more data that helps us navigate our daily lives, the more important powerful search techniques will become. The ability to store information in our mind suffers when cognitive load demands tax the capacity our limited working memory. Computers and the plethora of digital tools can help alleviate this problem. Those who use embrace digital tools to augment their mind/memory will be more literate than those who cannot. The freed-up cognitive effort of ‘outsourcing’ some of the mind’s most strenuous tasks to computers and technology allows more time for learning to occur. Research suggests that digital tools can enhance or work and our lives (Thompson, 2014) Without an app to save articles from the web, filter that content for specific information, and organize in a way that is meaningful for me, my life would be less organized. I would also miss countless meetings without the convenience of entering them into my calendar, setting a reminder, and then essentially forgetting about them. Thompson talks about the term ‘spaced repetition’ in reference to a digital tool he uses to help him remember content in the books he has read. Amazon’s Kindle app has the function to send reminders in the form of emails, which contain the important information you highlight in the book. These daily reminders follow an instruction strategy names spaced repetition. Spaced repetition works on the principle that we forget things over time, but this can be overcome if we review material on a regular basis. Amazon’s Daily Review is a unique solution to the problem of reading a book once and subsequently losing knowledge over time. The question of whether technology is making us smarter or dumber is somewhat irrelevant. Digital technologies are already integrated into every aspect of daily life. We must find ways to embrace these technologies to our betterment. Howard Rheingold is focussed on using technology to make use smarter. He asks the question, “What if humans could build electronic tools that leverage our ability to think, communicate, and cooperate?” (Rheingold, 2012) Perhaps we can harness new technologies to help us become more socially conscious and extend and augment the capabilities of our incredible minds? Some might say that our creativity may be negatively affected by the digital tools we embrace for our most creative work. If I am to be honest, I am easily distracted when working online. It is too easy for me to get sidetracked on a topic while browsing online. If I am not checking my Twitter feed, then I easily succumb to cross-checking something I have just read with another source online, and before I know it, half an hour has passed. Most of my eureka moments happen not when I am directly thinking about an area of research, but when I am cycling to work, or out for a run. Thompson explains that research suggests that if the content we are reading is meaningful to us, then we will remember it. If it’s not, we are likely to forget. From an educator’s perspective this brings us back to the age-old problem of attention, and how to create learning opportunities that are meaningful to students. As learners access digital tools in schools more and more, educators have an obligation to teach strategies to combat distractions while working online. It turns out that the self-regulated learning skills required to be a successful offline learner are the same ones required to be successful online. Thompson, C. (2014). Smarter Than You Think: How Technology is Changing our Minds for the Better. New York: The Penguin Group.